Promotions - Stroj-energijska tehnika d.o.o. 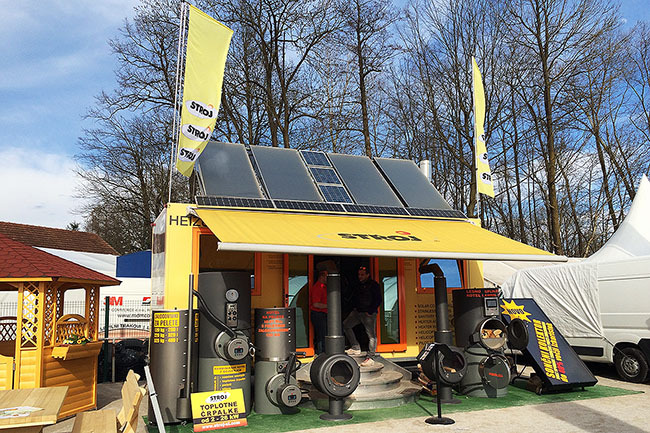 To promote our activities, our company, Stroj - energijska tehnika d.o.o., has designed and appropriately equipped an ENERGY INDEPENDENT MOBILE HOUSE. We can transport it anywhere, and clearly demonstrate the operation of the integrated energy system. 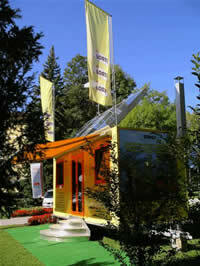 The energy independent mobile house is based on elements of the traditional Alpine architecture of Slovenia. The interior is adapted to modern living requirements, which are complemented by a pleasant feeling of hospitality – the indisputable feature of a wooden house. The wooden mobile bio house is a low-energy house, which consumes a very small amount of energy for space heating, and is well ventilated. These two exclusive properties are combined with the application of appropriate building materials and structure. The outer wall insulation results in a low heat transfer coefficient (less than 0.25 W/m2K). The wood contributes to the comfort and the feeling of nature that we expect and want in a pleasant home. The metal chassis of the mobile house enables secure transport, as it made from materials of the highest quality, and combined with the highest level of security and reliability (chassis, supporting structure, brake system, lateral stability, etc.). The exterior dimensions of the mobile house meet the requirements of road safety: 8,400 mm long (including the connecting segment), 2,500 mm wide, and 3,800 mm high. The 20 m2 of living space can be used by 4–6 persons. The entrance is protected by a canopy, so this surface can also be used as a small terrace. Layout of the interior offers a cosy kitchen with a gas stove, refrigerator, sink, a dining room, shower, toilet, and a bedroom with 4 to 6 beds. It is also equipped with all the necessary audio-visual technology (SAT TV, TV, radio, telecommunications, computer, internet, etc.). In the central part of the mobile house is an energy unit intended for the preparation of the physical parameters of comfort. The energetic portion includes arrangements for domestic water heating, central heating (radiators), and electricity production. The fireplace runs on biomass. The produced heat heats the living room directly, while the flue gases flow through the pipeline system, which constitute prenosnik toplote, integrated into the buffer tank. 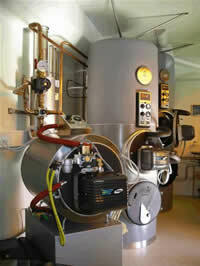 Two heat generators can be used for heating domestic hot water and central heating. 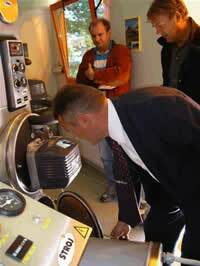 The first heat source is biomass burning in the fireplace, and the other is the heat produced by solar energy (SEC). The entire SEC surface amounts to 4.75 m2, while the heat transfer fluid (water) flows into the buffer tank (300 litres), positioned in the central part of the house. The solar part of the heating system does not need antifreeze, as the system is designed in such a way that the water withdraws from the solar circuit when there is risk of freezing. Control device with sensors and pumps powered by electricity generated by solar electric cells (220 V, 350 W) provide proper functioning of the entire system. The double base of the energy independent mobile house houses a 130-litre rain water reservoir (cold water for showering), while the attic contains another 260-litre drinking water reservoir. Installation of an energy independent mobile house on any solid ground is easy and fast; we use a built-in hydraulic system. In 2003, we have designed and built a special mobile exhibition container for the purpose of education and promotion at fairs in Slovenia and EU. The mobile showroom facility boasts various operative heating systems, which illustrate the operation of all our devices.